Find here the answers to most questions concerning Math Mammoth Light Blue series (the complete curriculum). For starters, the video below explains a brief overview (basics) of the curriculum. 4c. Does it work on a Mac, Linux, or Chromebook? 6. What is the difference between the Blue Series and Light Blue series? 8. Are earlier concepts reviewed in later levels? 9. I am concerned that there won't be enough review. Do the books have review problems that continue to review previous concepts? 10 Are tests included? And should I score every assignment or just tests? 11. Are there video lessons available? 12. What about kindergarten math? At what age is it appropriate to start your 1st grade books? 13. Will you be writing more grade levels? 14. How far can I use the Light Blue series? Will it cover pre-algebra or algebra? 16. How will I know when to review with computer games or worksheets rather than continuing? How will I know when to take a break and review an old concept so it will not be lost? Is this type of review incorporated in the program? 18. Are there lesson plans available? 19. Is Math Mammoth aligned with any state standards? 20. Does Math Mammoth curriculum encourage the use of manipulatives? 21. How and when to use the 100-bead abacus? 22. My son is having trouble with the word problems. I'd like him to get more practice with them. Is there a place to get more worksheets for word problems? 23. We are using the Light Blue Grade 1A. The kids ran into their first Puzzle Corner. I love it! However, it was pretty difficult for them. Should I give them more of those for practice before we move on? 24. Is Math Mammoth a spiral or mastery curriculum (horizontal or vertical math)? 25. Some graphics are missing from the PDF file. Why? 26. If my child needs extra practice, could I use the Golden series worksheet collections for that? 27. What is the origin of this curriculum? 28. What do you recommend for high school math? 29. Where can I get Mathy the mascot mammoth? 30. Does the author have any mathematics or education credentials? However, there are lots of videos that match the lessons in the curriculum, and those are often very useful in helping children learn the concepts. Also, in the introduction of each chapter I have included some general notes and helps for the teacher. And, of course the curriculum does include full answer keys. 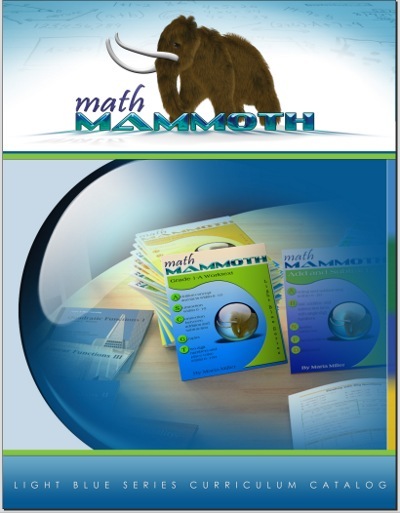 If you have previously used a scripted curriculum and are worried about your ability to teach with Math Mammoth, I would encourage you to try it out by purchasing one of the Blue Series topical books as they contain the same lessons as the full curriculum (just arranged by topics instead of grade levels). Lulu.com sells spiral-bound student texts, insides are grayscale (b&w). Rainbow Resource Center sells perfect-bound copies, both with black-and-white inside pages (cheaper) and with full-color pages. On the page for each grade of Light Blue series at MathMammoth.com you will find direct links to purchase printed copies for that grade level in these two stores. Yes. You can purchase each of the grade levels of the Light Blue series on a CD at Rainbow Resource Center. You can buy all available grade levels on one CD here at MathMammoth.com website, at Rainbow Resource Center, or at Homeschool Buyers Co-op (at special sales). Usually no, because the CD contains the exact same files as the download. Also, if you purchase a download, you may make a backup copy of the files on a CD or on a flash drive. However, a CD is a good option if you cannot download large files. Some people may prefer a CD so they can sell their used copy after using it, or so as to not lose track where the files are stored. Even if you purchase a CD, I recommend you make a backup copy, because CDs do not last forever. 4c. Does it work on a Mac, Linux, Chromebook? These two series have nearly the same lesson material. There are only a few lessons here and there that are in one series but not in the other. The main difference is in how the material is organized. The Light Blue Series goes by grades and being a complete curriculum also includes tests & cumulative reviews. The Blue Series consists of topical worktexts, and the material in each book usually spans 2-3 grade levels. So, which series you choose depends on your goals: Do you wish to have a complete curriculum for a given grade level? Go Light Blue. Do you wish to review or reteach only certain topics? Choose Blue. Do you want to cover all topics as in a full curriculum but without mentions of grade levels? Blue Series can work there as well. 7. How does the complete curriculum (Light Blue books) compare with Singapore math, Math-U-See, or other popular homeschool math curricula? Addition where the result goes over 10 (such as 6 + 8) is included in the last half of 1st grade and first half of 2nd grade. Regrouping in subtraction is studied both in 2nd and 3rd (mostly in 2nd). The concept of multiplication is introduced in the very end of 2nd grade but studied in depth in 3rd. Multi-digit multiplication is studied in length in the 4th grade, and studied once more in 5th (5-A). Decimals are introduced in 4th grade, then studied in-depth in 5th, and reviewed in 6th. Fractions are introduced in 2nd and 3rd grades, and studied some more in 4th. In 5th grade, they are in "focus". Then they are reviewed in 6th grade. Topics such as place value, measuring units, geometry, clock, and money are covered over several years in a spiraling style. The following topics are not reviewed much in later levels (mastery is expected): single-digit addition and subtraction after 1st grade, double-digit addition and subtraction after 2nd, and reading the clock and counting coins after 3rd grade. The multiplication tables and basic division facts receive a quick review in 4th grade but not after that. I cannot list every single concept and its progression in this short space though. 9. I am concerned that there won't be enough review. Do your books have review problems that continue to review previous concepts? First, the program includes mixed review lessons (one near the end of each chapter) and additional (separate) cumulative review lessons that you can use when needed. Both of these cover a mix of topics that have already been studied. Scondly, you can also use the worksheet maker to generate additional worksheets for practice. This worksheet generator requires an Internet access. If you don't have Internet at home, you can use it in an Internet cafe, public library, or at a friend's house, and save the worksheets on a flash drive to print later. Third, the introduction of each chapter lists some online games and resources, which can often be used for review. Fourth, the curriculum includes a lot of the word problems continually, and those word problems review topics from earlier chapters, because the word problems require the usage of several concepts all at once. In other words, I have not included very many word problems that ONLY focus on the topic of the lesson at hand — most of them cover a "larger area". For example, a word problem found in a multiplication lesson might require both multiplication and addition to solve. Similarly, word problems in the other chapters (such as money, measuring, division, or fractions) will include the usage of multiplication. This is a unique feature of Math Mammoth curriculum. Also, all the major concepts, such as addition, subtraction, multiplication, division, decimals, and fractions get reviewed in a sense because they are used all the time. For example, a child will keep using the multiplication tables when studying division and multi-digit multiplication. The student will use various addition and subtraction strategies in word problems about money and measuring and when studying place value. Division facts are used in long division. Almost lastly, you can use the online practice section of MathMammoth.com website to practice some math topics, such as the multiplication tables, mental addition & subtraction, finding factors, and more. Lastly, we now offer supplemental Skills Review Workbooks, which provide additional review in a SPIRAL manner, matching the progression of topics in the Light Blue series curriculum. 10. Are tests included? And should I score every assignment or just tests? Yes. There is a test for each chapter and an end-of-year test to be used after each grade level. Each test includes a grading rubric. However, you don't have to follow the grading rubrics -- they are provided for you just in case you want to use them. Personally, I feel that grading needs to be done in such a manner that it doesn't discourage the child. So it really depends on the child. Some children do better if they only receive feedback about where they need to work more, how to fix errors, etc. All grading is best accompanied with notes such as, "You worked hard and I appreciate that!" "Here you show you've learned this topic and worked hard in it," so that the emphasis is on the appreciation of the hard work and on giving feedback on specifics, and not on the actual percent score. On the other hand, if a child is getting a "big head" (proud) over their accomplishments, you could find a really hard test so they can learn they have room to improve. But this is not nearly as common as the opposite situation where children are discouraged and think they "can't do math". I don't recommend grading the day-to-day work with percent scores or letter grades. Of course you need to find if the student made errors, but that should be sufficient. Also, when you assign a final mark for a whole grade, don't look at only the tests but also at the overall accomplishments, the effort, etc. I like to give my children assignments outside of tests that count towards the final mark. In math, it could be for example a neatly written solution to a hard word problem, a set of definitions for geometry terms accompanied by drawings, or a description or exact instructions for a math game. Those can then go to their portfolio if you use such. Most children in our society tend to get the idea that math is about "speed" and getting correct answers, and thus math test scores become really important to them. We need to discourage that line of thinking. See also my article on Timed tests and how it damages students learning of math. Yes. There are LOTS of free videos, found here, that match the lessons in the curriculum. There is not a video for every single lesson... but I am constantly adding more as I'm able to edit & upload videos we've filmed in the past. There are no Math Mammoth books for kindergarten, but I've written a fairly comprehensive article about kindergarten math to use as a guideline. You can start 1st grade once the child can write and recognize numbers, count to 20 (preferably to 30 or beyond), has mastered basic concepts of equivalence, more, and less; and has a basic idea of addition. Sometimes kindergarten-age children start with MM 1-A and there's one topic there that can become a frustration point if the child is not ready for it. It's the topic of "missing items" or missing numbers in addition problems, such as 2 + ___ = 5, or even simpler: 2 + ___ = 3. The idea is to ask the child, "2 and how many more makes 3?" Objects can also be used. This particular lesson, "Missing Items," is fairly early in 1-A. If this lesson presents problems for your child, then he/she is not ready for 1st grade math. In that case, you could get one of the recommended kindergarten workbooks for the child and wait a month or a few months before trying again. 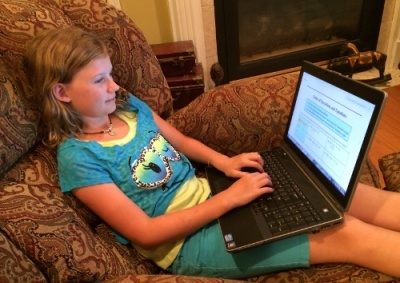 Math Mammoth Grade 7 is designed to be a pre-algebra curriculum. It covers integers, linear equations, slope, ratios, proportions, percent, the Pythagorean Theorem, geometry, statistics, and probability. After completing Math Mammoth grade 7, students can continue to algebra 1. 15. How do I pace the Light Blue curriculum? How many pages or worksheets per day should the child do? For pacing, check how many actual lesson pages there are to study (this is mentioned on the web page of the book, below the cover image), and how many days of school you have in mind. Then to get how many pages per day you would need to study, divide the number of pages by the number of days. The user guide for each grade has this information also. Assuming you have school 5 days a week, about 40 weeks a year, the student should study between 1 and 2 pages each day. If you homeschool for less than 200 days a year, you will probably need to study 2 or more pages a day. Please allow some time also for tests and cumulative reviews. So as a general guideline, about 1 1/2 pages a day is sufficient for grades 1-2, about 1 3/4 pages for grade 3, 4-6th graders should aim to do about 2 pages a day, and 7th graders about 2 1/2 pages. However, you need to pace it depending on how the lessons go. Sometimes your student might be able to do several pages in a day, and sometimes the student cannot do but one page. Also, in some topics you might be able to go through the pages quicker, for example in the chapters about clock, because the clock pictures are so large that one page does not have many problems. 17. For drilling the addition and substraction tables should we just go over each lesson over and over until she memorizes her tables? In collaboration with Homeschool Buyers Co-op, we have developed a type of "lesson plans" for the calendar planner product sold by the co-op, titled Homeschool Planet. 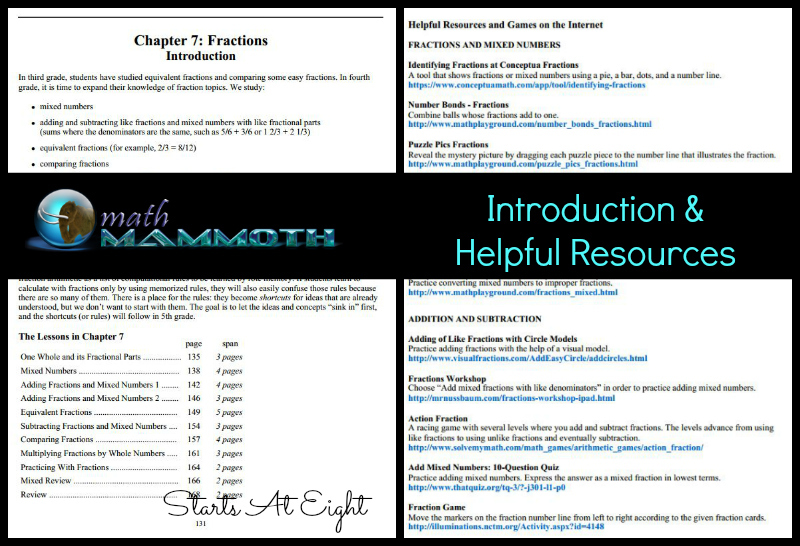 These lesson plans pace the Math Mammoth curriculum, assigning certain pages to be done on each day, along with instructional videos and Internet resources (games, quizzes, animations) that match the lessons. Then, Homeschool Planet allows you some flexibility. For example, you choose how many days a week math is studied or on which date to start the lesson plan. You can also "push forward" all the remaining days in the plan if you miss a day, and do similar things. You can order these lesson plans here. The price is $9.95 per grade; discounted bundles are available. Please note: You will need the calendar product Homeschool Planet before you can use these plans. Grades 1-7 meet and exceed the Common Core Standards. Please see this FAQ for more information. The only way the abacus is used in my books is as a simple counting frame, where each bead counts as ONE. Nothing fancy. It is NOT used like Chinese, Russian, or any of the other abaci where one bead might count as 5, 10, or 100. A 100-bead abacus (or school abacus or a counting frame) simply contains 10 beads on 10 rods, a total of 100. In the school abacus, each bead simply represents one. The 100-bead abacus lets children both "see" the numbers and make them using their fingers (kinesthetic learning). 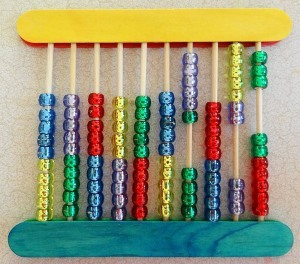 See also these ideas on how to use the 100-bead abacus. At Amazon you can find Melissa & Doug Classic Wooden Abacus at Amazon for around $12. An abacus or counting frame where the beads alternate colors by fives is even more useful. 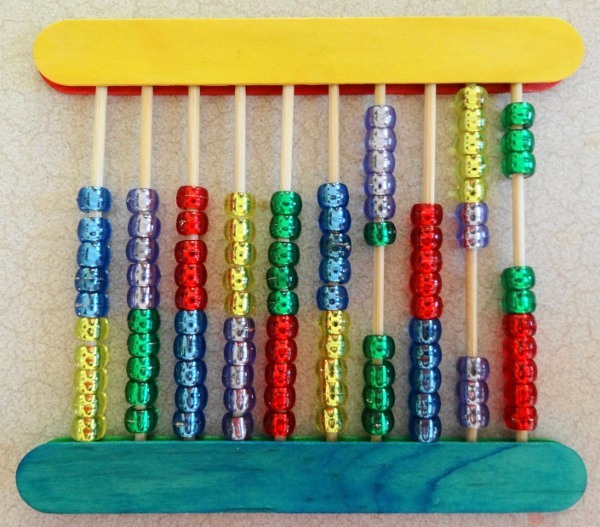 TIP: If you get a regular abacus with 10 beads the same color, paint a thin white line on the right side of bead #5 and also on the left side of bead #6 on each row (counting from the left). This will make it easier to see 5 and 5 on each row. 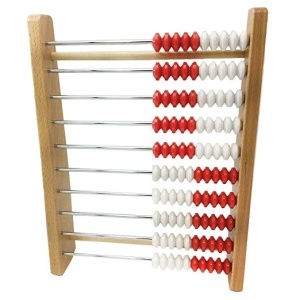 You can also use this virtual abacus (Click the + symbol to add rows of beads). Or, make your own abacus. Just don't make it exactly like they show on that web page but instead use 10 bamboo skewer with 10 beads in each so you get a 10 x 10 abacus. 22. My son is doing 4-A and having trouble with the word problems. I'd like him to get more practice with them. Is there a place to get more worksheets for word problems? Please read this article to help you further understand the issue with word problems and to find further resources to help. The puzzle corners are meant to be challenging so don't worry if it was difficult. You don't have to "practice" them as such because they are not something that the children absolutely have to master. They have several purposes: to challenge children to think, and also to inspire them about mathematics. There are more coming later in the curriculum. If you notice the puzzle corners start discouraging the children, please skip them or don't require them to get the right answer... that defeats their purpose. The idea is to get them try to solve something challenging, even if the don't get the correct answer. The thinking process and the trying is the important part. That said, you can find more practice if you google "math puzzles for kids". But don't force the children to have to do puzzles... try instead encourage them to do them so that they would learn to LOVE the challenging of their minds. For that to happen, you MUST not put down mistakes or failures, but emphasize how good it is that they work hard... EVEN IF they don't get the answer. Please also read this article of mine: The value of mistakes. You can have a puzzle day once in a while where you present them other challenging problems. Check this list of additional word problem websites. At any rate, do not stop there at the curriculum but just move on. Math Mammoth is basically a mastery-based curriculum. Some topics are studied till mastery within one and the same chapter. Examples of such topics include regrouping 2-digit numbers in subtraction (2nd), multiplication tables (3rd), and long division (4th). However, often the topic is present in two (or even three) neighboring grades. Examples include: equivalent fractions (both 4th and 5th grade), percent (6th and 7th), factoring (4th and 5th). Some topics are "developed" to mastery over several grades, going from simple to more complex; for example reading the clock (grades 1-3), counting coins (grades 1-3), fraction arithmetic (grades 4-5), decimal arithmetic (grades 4-5). However, you CAN use Math Mammoth in a somewhat spiral manner simply by having your student study in 2-3 chapters simultaneously. In that manner, the curriculum is very flexible! This is a common problem in Mac computers. If it some images are missing , download and install Adobe Acrobat Reader for Mac from this link, and open the PDF files in it, instead of in Mac's native PDF viewer. Another possible problem is that some graphics/images will not print on a Mac. Try the "Print as image" option in the "advanced" section of the printer window, and see if that helps. 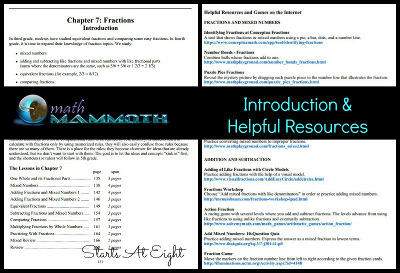 First of all, keep in mind that Math Mammoth curriculum comes with a free worksheet maker, which allows you to make worksheets for most of the topics in the curriculum (though not for all, for example not for word problems). The problem with using the Golden series worksheets collections is that they were written in 2006 to match the then Virginia standards, whereas the Light Blue series follows Common Core. So, the Golden series collection won't have all the topics that the Light Blue series has in any grade, and vice versa. The Golden series books still have lots of good practice problems but you can't count on finding problems for all the topics in the corresponding level of Light Blue series. Besides the free worksheet maker provided with the curriculum, you could also use Khan Academy because in the past few years they've added lots of interactive practice problems following the Common Core, so those will match the topics in Math Mammoth Light Blue series fairly well. They do have some word problems even. You may not find challenging problems there though. To find the problem sets, you need to go to www.khanacademy.org/commoncore/map, not to their regular home page. Then there are companies that provide practice problems for all possible topics in a particular grade (subscription-based), for example www.ixl.com. I initially wrote books for certain topics, and later those books gave rise to the Blue Series books you can see on this site. You can get Mathy at Amazon.com. Check out also some mammoth coloring and dot-to-dot pages we have here! Yes. I have a master's degree in mathematics (1997) after studying 5 years in the university of Joensuu, Finland (nowadays called the University of Eastern Finland), and one term at the University of Nottingham, UK. My degree includes minors in physics and statistics, and the educational studies required to become a teacher (in Finland).